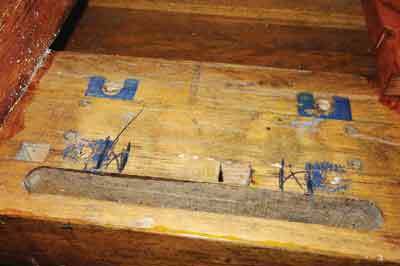 Previously, I have described restoring an old Lervad workbench for my daughter Amber. 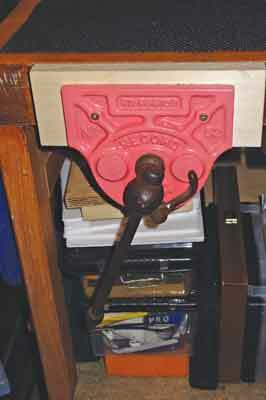 What it lacked was a small vice, so I went looking for one as I only had a big secondhand Record 53.1/2 E in stock. Judging by the blue marks underneath the one I found, it was a Record vice before and the bolt spacing meant it had to be a No.50 model. Secondhand vices fetch good money, so I thought I had a bargain on a very vintage quick release version, at Â£25. I had a gut feeling it might not match because of its age, as it turned out, I was right. The book Planecraft by C & J Hampden, then owners of the Record brand, put the vice's age at pre-1960s, whereas the Lervad was probably a 1970s bench model. Because it was so old, the quick release on the No.52 didn't even have a dust cover at the vice rear, let alone over the buttress thread. A good cleaning and degreasing followed. The first thing to do was to mark and cut out recesses to take the cast reinforcing ribs behind the rear jaw. I used a pullsaw to work into the tight 'pocket' space where the jaw would sit. This would then allow me to chisel out the waste until the vice bedded into place nicely. The next stage was getting the bolt holes to line up, which was not an easy job. Two were more or less in line and the bolts wound in, so the rear vice jaw was pressed forwards against the front inside face of the jaw pocket. Once that was done, I could re-drill the other two holes and wind those bolts in. The last job, being a bench for marquetry work in the main, Amber decided to paint the vice front in a smooth pink - Direct To Metal Hammerite - at least I persuaded her not to paint the tommy bar, shaft and quick release lever as it would have worn off! 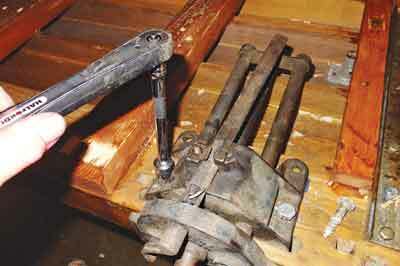 Last of all, a careful re-greasing for the vice bars. 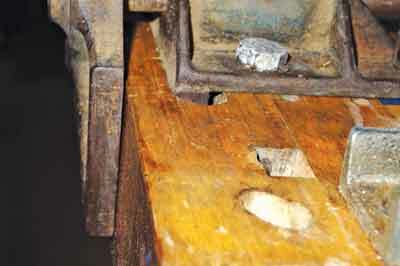 This older model vice required slots, which help to accommodate the ribbed casting. 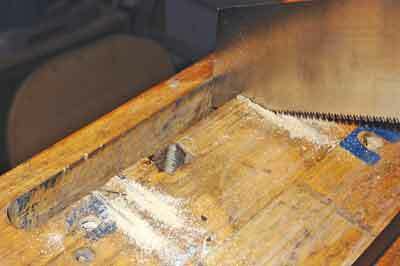 A Japanese pullsaw was ideal for making restricted stop cuts behind the vice jaw slot. A bit of chiselling was needed until the ribs fitted in properly and vice casting seated flat. Luckily, I discovered that the first two bolt holes were a virtual match for the existing ones, although new holes were needed at the rear. 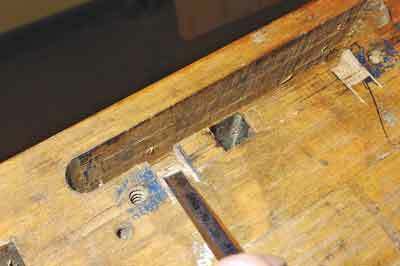 The next step was a check for slight vice 'toe-in', which is essential if the jaws are to grip the work properly. Pink paint - it is my daughter's vice - plus new birch ply jaws with leather facings for delicate workpieces complete the fit.